Welcome to Kurt's German Autowerks, located 30 miles southwest of Chicago in Homer Glen, IL. 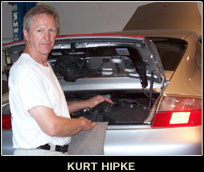 Kurt Hipke is a Master Technician with over 30 years of experience working with Porsche & Audi brands. Kurt's German Autowerks offers a wide range of services at extremely competitive prices. Next time your Porsche or Audi needs service don't pay dealer prices. Call us at (708) 301-2910 or (708) 431-6130, or click here to send a service request.